Major support for pgEd’s current projects is from Harvard Medical School and the Department of Genetics, five-year Science Education Partnership Awards from the National Institutes of Health*, gifts from Drs. 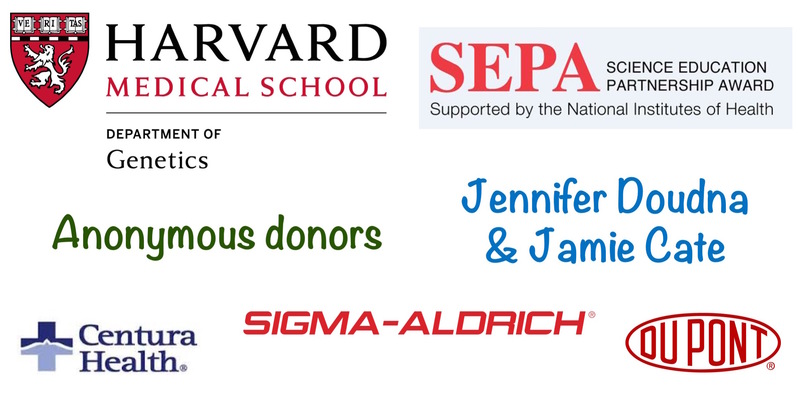 Jennifer Doudna and Jamie Cate, and anonymous donations. pgEd also recognizes Centura Health, DuPont, and Millipore Sigma for their gifts to pgEd within the last three years. We acknowledge in-kind support from Centura Health, Dutton, Frontline Genomics, the National Association of Biology Teachers, and Veritas Genetics. To learn more about our work and how you can support the specific projects we are launching, please contact Dr. Marnie Gelbart or Dr. Ting Wu for more information. * Our SEPA-funded projects are supported by the Office Of The Director, National Institutes Of Health under Award Numbers R25OD021895 and R25OD020205, respectively. The content is solely the responsibility of the authors and does not necessarily represent the official views of the National Institutes of Health.